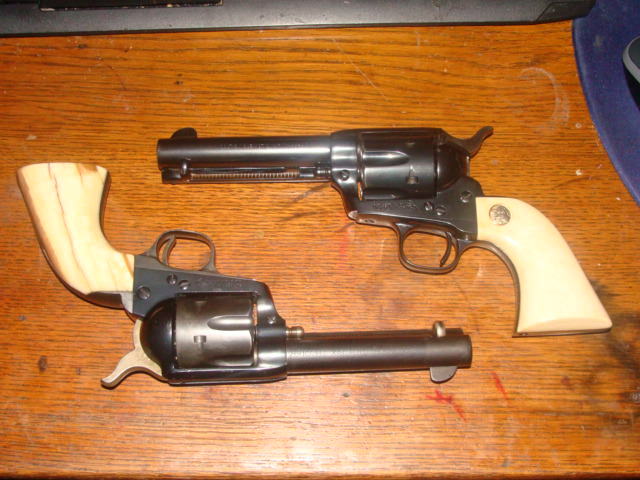 Gentlemen I would like your recommendations on some faux ivory grips for Ruger Blackhawk and Ruger super Blackhawk. I have heard of a wood, I don’t remember,I believe it was holley?that is used for a set of grips and something called ivory wood in addition to all the plastics polymers etc. any thoughts or ideas appreciated thanks. The wood you are asking about is American Holly.Do a web search of Holly grips and you should find a lot of photos.They start out snow white and yellow with age under an oil finish. I have a set of American Holley grips by CLC grips. Here is a pic of them when they were new back in 2006. They have aged and darkened considerably since, but I can't find the pics I took ... yet. Holley trees were grown locally commercially for the Christmas trade and shipped world wide.Fake Holley decorations killed that many years ago. Holley trees don’t normally grow large so finding large enough pieces to make grips is fairly difficult and they command a premium price when quality blanks are found. That said , Holly makes a very nice substitute for Ivory. You want clear wood without heartwood and it must be properly dried or warpage is sure to happen. Expect to pay as much as highly figured Walnut. Friend Six sent me some a couple years back. Thanks Six ! After letting it climatize to our area it did warp some. I ended up using it for knife handles.they do look like Ivory. I may have asked this before, but who made you're grips? They look gorgeous. Looks like CLC might be out of business. I just tried your link and those in my bookmarks and could not get to his site. "Due to health problems I’ve had to stop making grips. Right now I don’t know exactly how long this will be. I hope to get back to it in the future. You can check this site from time to time and if this message is gone, you will know that I’m back in business"
However, I have no first-hand experience with it, but have been tempted to make a set from it when I have more time. Good luck! 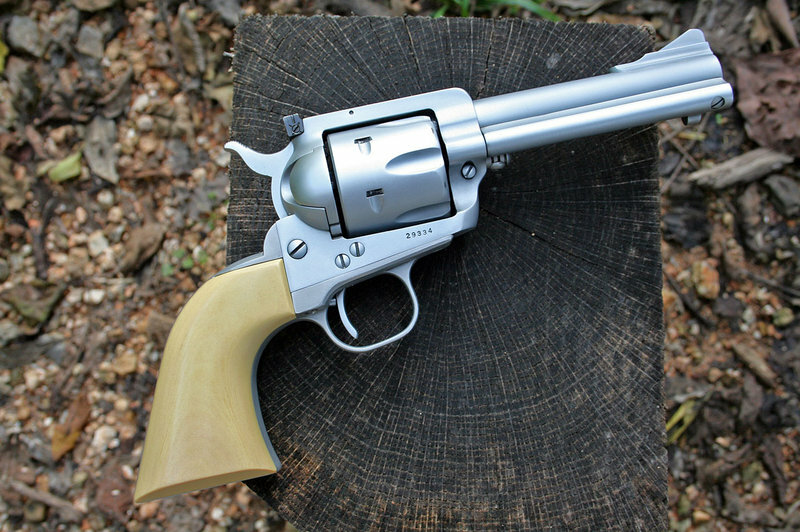 I've happily used some grips called "Tru-Ivory" on a couple of my Colt SAAs. It even yellows some with age or can be stained with tea. Comes from Bar S Grips online. I bought mine from a vendor at the "Show Me Shootout" in Branson but can't remember his name. 'course I can't remember much of anything these days. Seems to me I remember $75 to 150 depending if checkered, steer head, eagle etc. I like the one piece style that must be glued together in the middle. Left is Walrus that is fossilized I think and the other is ivory from the Colt custom shop. $700 back in '72. That is $4,257 adjusted to today's dollar buying power!